If you like to build a variety of castles, or just want to decorate the area near his home, mod Statues Mod will do it in the best possible way! Statues Mod - an interesting mod for Minecraft 1.7.10, which adds to the game a variety of statues and benches, so that you can not only diversify the game, but also to make the area around you is much more interesting and more beautiful! 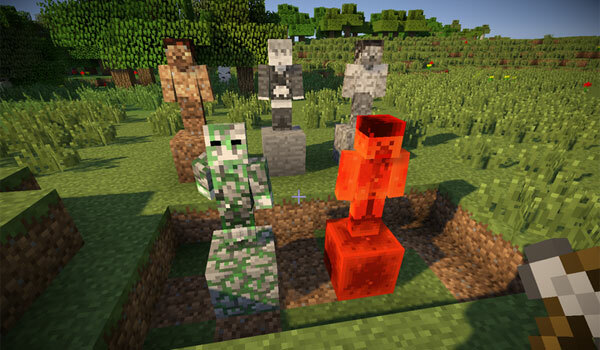 The mod adds a possibility to create a statue in the form of a game character of all blocks. So you can create a simple stone statues and statues of gold or diamonds! In addition, Statues Mod Minecraft adds a special stand, which can hold your sword. And the stand can be opened and closed to show your main weapon to your friends!